The new expat often leaves home surrounded by an entourage at the airport. The goodbye may last for days, weeks or sometimes months. My first move involved lunch at a restaurant before boarding the plane, relatives gathered while we solemnly made our way through the last supper. I have a picture of me sitting on my Dad’s lap as we’ve squeezed in around the table for the last picture. We all drove to the airport together, Mum cried, I cried, actually we all cried. I remember sobbing on the tarmac to the point that the air steward brought me a fresh packet of Kleenex. Fast forward 15 years and things look a little different. There are way too many children and suitcases for anyone to consider giving us a lift to the airport and even if that weren’t the case I banned airport goodbyes years ago. My family and I have developed tricks of the trade for our farewells. For a start we don’t ever say the words. Goodbye and any conversation of how long or when we’ll see each other next is banned. “See you next time” is a popular choice. My father will always finish with a “look after yourself love.” My sister and I haven’t said a formal goodbye for years, we just keep pretending we’ll see each other again in full knowledge that we won’t. “I won’t say goodbye now because I’m sure I’ll see you again before you go” works well in goodbye avoidance. 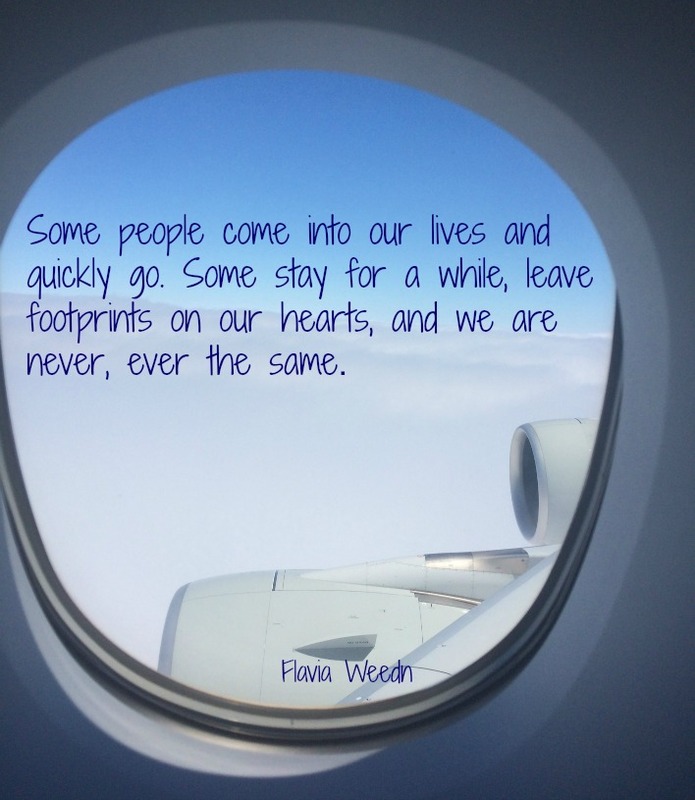 I was sitting with a girlfriend of mine recently who has been travelling for as long as I have when she confided that her days of crying with relatives and friends when saying goodbye were over. “I never cry now” she said almost dismayed with herself. “Actually no, when I get on the plane, when we’re all packed and everyone is on safely and I realise we’re leaving the country, I’ll cry then.” I felt the same way. Leaving is always such a drama, getting the house clean, the sheets washed, the fridge cleaned out. The airport is a rush, the last minute stash of Australianess before getting to the gate. It’s when the plane slowly rolls to the runway that the tears fall. We agreed that we had become the masters of avoidance, over the years they’d been so many goodbyes we’d learnt how to duck and weave our way through them. As a seasoned expat I now find myself trying to do the same on the flip side. I have avoided saying goodbye to a few friends here in Qatar because I really can’t face the thought of returning in August and them not being here. This year for me it’s school friends, women who I have completely taken for granted. They are the women on the bleachers at softball, my initiators of class parent activities, my fellow hamburger patty makers, the women who suffer through my complete lack of knowledge of how things work at school. They tell me when they think I’ve written something well, raise an eyebrow if they don’t. A couple of the goodbyes have been of the last minute variety. I sent a girlfriend a text recently upon hearing the news “Nooooooooo, I feel like I’ve wasted time, I just assumed you’d be here next year?” She’s one of my favourite people here. The person who immediately brings a smile to your face, the one at the party, the parent/teacher night, the ball. The one you gravitate towards, maybe even hide at the bar downstairs and giggle over a cosmopolitan together. I have a group gathering on Wednesday, another on Thursday and plans for a final farewell on Friday. I have thought about how to exit, how not to say goodbye. With family it’s hard but there’s always the knowledge of home and a return, with expat friends there is no mutual future destination. G and I will not be moving to Montreal, New Orleans or Houston. I cannot duck with a “I’ll see you again before I go” or weave with a “see you next time” because this time it’s a little more final, these goodbyes have caught me, forced me to stop and face the farewell. This time the tears on the tarmac may well fall in Qatar.